Icicles are some of the most beautiful creations of nature. An icicle is formed when dripping water freezes, forming a long tapered point. It’s common to see icicles on your car when it snows, off rocks, and off trees. However, when you see icicles on your gutters or roof, this is not a good thing. In fact, it is a very bad thing as icicles are a sign of possible ice dams. Plus, the weight of icicles can rip off gutters, shingles, and ultimately lead to leaks in your home. 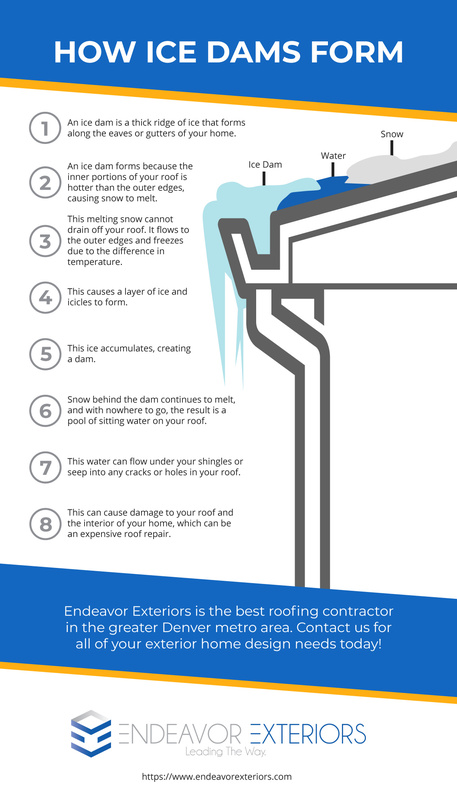 Endeavor Exteriors, the best roofing contractor in Denver, will explain how icicles are a warning sign instead of a beauty sign. Contact us today for your free roofing repair estimate! 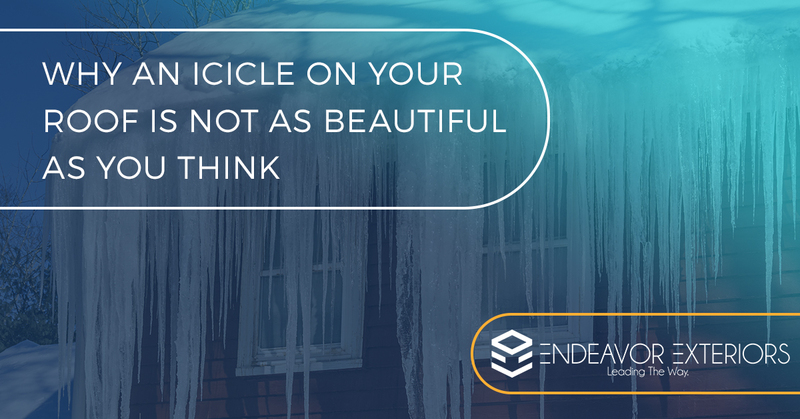 An ice dam is a thick ridge of ice that forms along the eaves or gutters of your home. When an ice dam forms, melting snow cannot drain off your roof. Water then can pool behind the ice dam, causing leaks in your roof. Leaks in your roof spell DANGER. From peeling paint, warped floors, stained and sagging ceilings to wet insulation and wood in the attic which can be a breeding ground for mold and mildew, leaks in roofs can lead to structural damage as well — a major fix and expense for homeowners. Your roof is hot from heat in your home except at the edges of your roof, known as eaves. When snow falls, it melts from the hot portions of your roof and begins to flow off the roof. However, when it reaches the places on your roof that are colder (usually around your eaves) it freezes, resulting in ice and icicles. Ice and icicles accumulate along the eaves, forming a barrier to water known as an ice dam. When the snow and ice behind the barrier melts form your warm roof, the water has nowhere to flow to. This water is now just sitting on your roof and if there are any holes or cracks in your roof, the water flows under your shingles and into your home, causing damage to your roof and to the interior of your home. If ice dams have already formed, there are several steps you can take to rid your home of ice dams. Endeavor Exteriors in Denver beseeches you not to take a hammer to your roof and flail away. This is not a good idea. You can damage your roof and your home if you apply enough force. Similarly, taking a shovel can yield the same results. Throwing salt on your roof is not a good idea either. However, you can use a rake rake or a broom while standing on the ground to remove snow from your roof. Most rakes will not damage your home; however, be aware of the force you are applying to your roof. You can put a simple fan in your attic, which will blow cold air and stop any leaks from occurring as the leaks would instantly freeze if you do notice water leaking into your interior space. Also, you can create your own channels for the water to flow from the roof. Ventilation. Airflow will be key to preventing ice dams on your roof. Install a ridge vent and other vents to circulate cold air under the roof. Add in baffles along the roof’s edge to help with the airflow as well. Seal your hatch. If you have any openings in your roof, heat will escape. One of these places to check is your attic hatch or a whole-house fan opening. Cover these in the winter. Check your exhausts. Fans from the oven, bathroom, and dryer vents all release air outside. Make sure these are releasing air through the roof or walls but not through the soffit (the underside of your eaves). Seal and insulate any of these ducts as well to prevent air leakage. Insulation. Insulation in your attic will keep your heat where it belongs — in the home, not in your roof. Upgrade your can lights. Older-style recessed lights usually shaped like a cone called can lights are those lights installed above the ceiling lines. These lights give off lots of heat and thus could not be insulated due to fire safety concerns. Replacing these older lights with IC (insulated contact)-rated lights, which allows insulation to be installed around them, prevents loss of heat to the attic and roof. Seal your chimney. The area around your chimney can be a big source of heat leakage. Seal the gap around your chimney using flashing. Also, consider the portion of your chimney in the attic (if it goes through your attic). Make sure your chimney is insulated as well as any duct work associated with your chimney or wood stove. Caulk any other small holes or cracks. Check your entire roof. If you have electrical cables or other ventilation piping, make sure you seal off any airways with fire-resistant sealant. The goal of preventing ice dams is to make the ceiling airtight so no warm, moist air can flow from the house into the attic space. The tips above will help to seal any air leakage paths between the house and the attic and keep the heat inside your home by adding insulation. You may notice once you’ve taken the action steps above to prevent ice dams that more snow is accumulating on your roof than before (because now none of the snow is melting). This is okay. Modern roofs are built to withstand heavy snow loads, which your local roofing contractor can help you with. Natural roof ventilation uses wind that is naturally blowing to push warm air that naturally wants to rise out of your home, creating a circular cycle. Natural roof ventilation works well in the summer and adequate in the winter. However, with the tips implemented above, you should have plenty of air ventilation to keep your roof’s temperature uniform. Endeavor Exteriors, the best roofing contractor in Denver, desires to give you the best customer experience in roofing. We do this through leveraging technology that brings value and convenience to the customer. Through a few simple photos taken by the homeowner via an easy-to-install app, homeowners will get a 3D model of their new roof within a few hours of submitting their photos. Homeowners are then able to sample colors and materials and see what these would like on their home. This gives homeowners ownership over their roofing project from start to finish and gives them confidence they are making the right choice for their roof — an integral and valuable part of their home. Our app, Hover Connect, takes the guessing out of roofing. Endeavor Exteriors in Denver offers up services for any home exterior need. We do residential roofing, commercial roofing, multifamily roofing, roofing repairs, roofing maintenance, and roofing inspections. We replace doors and windows, and install and replace siding. We offer financing, which you can apply for online and receive a response back quickly. Furthermore, we work with all insurance agencies when you have a claim, such as damage from hail or fire. We offer a limited lifetime warranty on our installation and maintenance roofing work. We understand that we’re human — defects in products or installation and other unexpected issues can arise. We address any problems or concerns you have about our craftsmanship immediately and efficiently. At the end of the day, it’s about customer satisfaction. Endeavor Exteriors aims to make your roofing project (whether it be residential or commercial installation or roofing repair and maintenance) as seamless as possible. The less you know we’re there, the more we’ve succeeded. We want your roofing project to be the best customer experience from start to finish and your new roof or roof repair to be breathtakingly beautiful. Endeavor Exteriors is the most thorough, most innovative roofing company in the greater Denver area. Save time. Save money. Call Endeavor Exterior in the Denver metro area today!